Dispense the Blueberry Gelée into a Silikomart Micro Dome Mold (5920030402) half way full and freeze completely. Once frozen, dispense a layer of the Lemon Panna Cotta on top and freeze completely. Pipe the Blueberry Mousse into a Silikomart Flexi Half-Sphere Mold (591003), making sure to leave room for the insert. Remove the inserts from the first mold and press into the mousse in the second mold, followed by circle cut-outs of the Lemon Financier Sponge Cake. Scrape off any excess mousse and freeze completely. 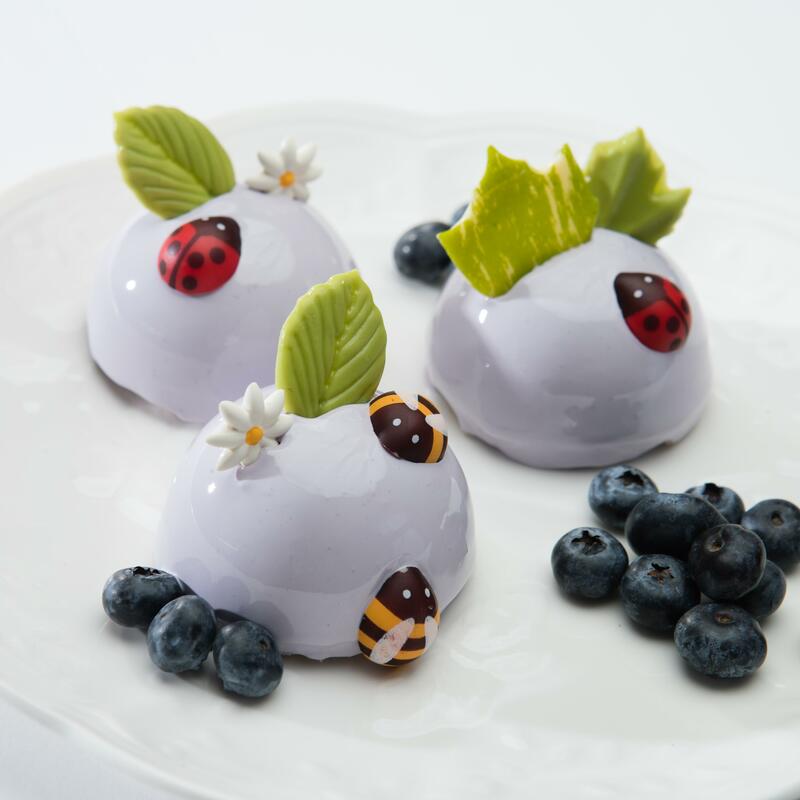 Remove from the mold and coat with the Blueberry Glaze; garnish with chocolate décor ladybug (608247) and bumble bee (608249) as desired. Combine the blueberry purée and fresh blueberries in a saucepan and bring to a simmer. Whisk together the sugar and pectin, then add to the blueberry mixture. Bring to a boil for 1 minute; remove from heat and whisk in the lemon puree. Combine the panna cotta mix with half and half in a saucepan and bring to a rolling boil while stirring constantly. Stir in the lemon compound. Whisk together the Alaska-Express neutral mix and water. Fold in the whipped cream in three parts and fold in the blueberry compound. In a stand mixer with a whip attachment combine the egg whites with the sugar and whip till medium peak. Zest the lemons into the sifted dry ingredients then fold into the meringue. Add the scraped vanilla bean into the melted butter, and then fold into the batter. Spread onto a flat sheet pan lined Silikomart mat and bake at 350°F/176°C for 12- 15 minutes or until it is done. Heat the glaze to 95˚F/35°C and combine with the blueberry compound in a bowl. Gently mix in the gel color until dissolved, careful not to whisk to avoid bubbles.